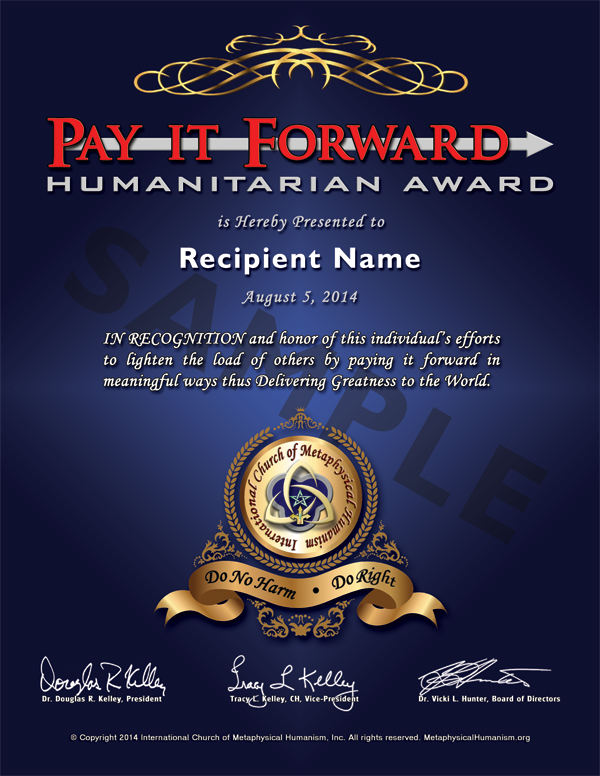 The concepts of Doing Right and Pay it Forward are among the foundational principles and Sacred Obligations of the International Church of Metaphysical Humanism (ICMH). It is only fitting, therefore, that ICMH offers humanitarian awards to recognize those individuals who Deliver Greatness in meaningful ways for the benefit of others. The criteria for the two humanitarian awards ICMH confers vary slightly (see below). ICMH looks for opportunities to confer these awards. In time, the lists below will undoubtedly grow. If you know someone who should be considered for one of these awards, please contact admin@icmhchurch.org. Be sure to give a detailed explanation as to why the person is qualified for one of these awards. To recognize a specific and meaningful act of kindness directed toward another person(s). It is generally easier to qualify for this award. This award was initiated in December 2014. "IN RECOGNITION and honor of this individual’s efforts to lighten the load of others by paying it forward in meaningful ways thus Delivering Greatness to the World." Dr. Zachary Greiner, U.S., February 2018. Given for generous support of ICMH Church's global educational work. To recognize a person for having a history of kind and meaningful acts toward others. This award is usually conferred on someone after several years of kind acts. It is more difficult to qualify for this award. This award was initiated in January 2013. 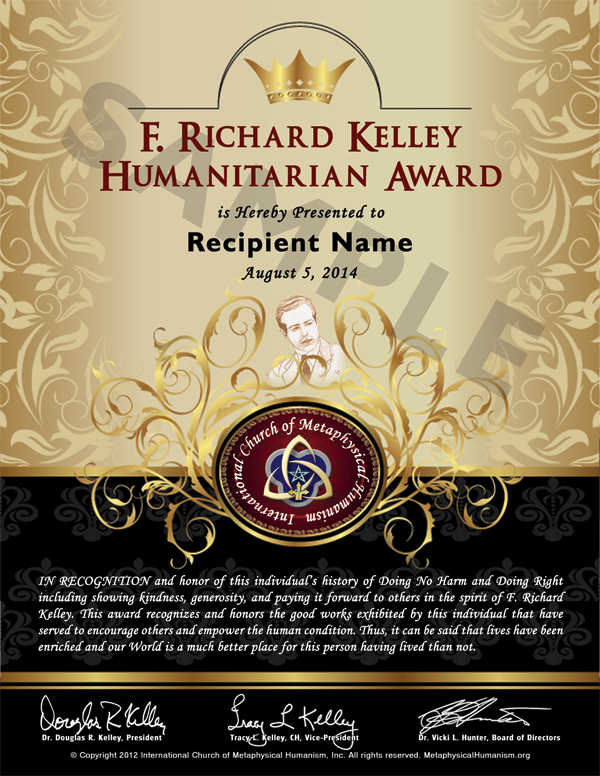 "IN RECOGNITION and honor of this individual’s history of Doing No Harm and Doing Right including showing kindness, generosity, and paying it forward to others in the spirit of F. Richard Kelley. This award recognizes and honors the good works exhibited by this individual that have served to encourage others and empower the human condition. Thus, it can be said that lives have been enriched and our World is a much better place for this person having lived than not."